The natural defense against heat and ultraviolet exposure. Now, when blistering heat and UV rays aim for your dashboard, you have the ultimate defense. Pinnacle Vinyl & Rubber Protectant works like a shield against the sun to prevent cracking and fading of all your vehicle�s interior vinyl, rubber, and plastic. With regular use, your interior surfaces will look just like new for the life of your vehicle! We�ve all seen what happens to unprotected vinyl and rubber. Dark colored dashboards fade and smooth vinyl upholstery cracks and creases. In just a few short months, your flawless interior becomes a prime example of a detailing don�t! Regular applications of Pinnacle Vinyl & Rubber Protectant fend off UV damage to keep your vehicle�s interior looking like new. Our state of the art protectant contains UV inhibitors that block the sun�s intense rays from penetrating and altering plastic, rubber, and vinyl surfaces. Over time, your vehicle�s interior retains its factory color and resists drying and cracking. Vinyl & Rubber Protectant is a water-based conditioner that nourishes your interior surfaces so they remain supple and moisturized. It contains NO petroleum distillates that can dry out the vinyl over time and cause premature cracking. Natural ingredients combined with high-tech protectants restore the original color and sheen to vinyl and rubber surfaces while shielding them from UV rays. This is no ordinary vinyl dressing! 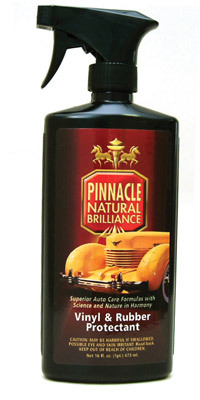 Pinnacle Vinyl & Rubber Protectant is the perfect accent for show cars and other fine automobiles. The premium protectant produces a healthy, satin sheen, much like the natural appearance of new vinyl. Your interior surfaces will have an attractive glow, not an artificial shine. This formula is non-greasy and will not attract dust like many vinyl dressings, while the natural conditioning oils provide a fresh, clean scent. Your interior will look, feel, and smell great and remain in that condition with regular application of Vinyl & Rubber Protectant. Treat your interior to the conditioning protection of Pinnacle Vinyl & Rubber Protectant! If your interior surfaces are particularly soiled or neglected, use Pinnacle Leather & Vinyl Cleaner first. If the area is relatively clean, you can go straight to the protectant. Spray Pinnacle Vinyl & Rubber Protectant onto a microfiber applicator pad. Wipe the dash, door facings, moldings, and door seals. Note: When applying Vinyl & Rubber Protectant to the steering wheel, avoid the outer edge where you grip the wheel. If applying to hard rubber or tires, allow the protectant to penetrate for several seconds. Wipe away any excess product with a clean Cobra Microfiber Detailing Towel.